PUNCH AND JUDY ON THE WEB, linking Punch professors and enthusiasts worldwide. Welcome to the World of Punch & Judy. A rich tribute to an endearing and enduring rascal. The English Mr.Punch is truly an international character as well as being the British National Puppet. His origins are in Naples, whilst his family is worldwide. As Punch he appears in all English speaking parts of the world with dedicated Professors in Canada and the USA, in Australia and in New Zealand. His close relatives Polichinelle and Petrouska hold sway in France and Russia, Casper in Austria, Hans Wurst in Germany. Turkey has Karagoz and there's Jan Klaassen in Holland. There's Bavarian cousin Kasperl, Pulcinella in Italy, Tchantches in Belgium, Karaghiozis in Greece and Guignol in Lyons. If you are a lover of Punch, a performer of Punch, involved in an academic study of Punch, a student of folklore and tradition, want to see a Punch show or are just interested in booking Punch & Judy for a birthday party, then you should find what you want here. Find where to book a Punch and Judy show. 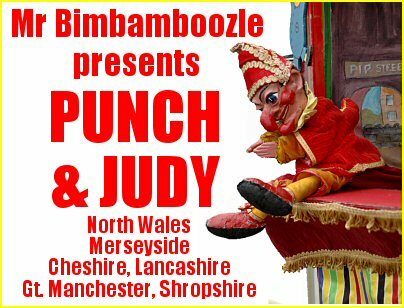 Mr Bimbamboozle presents Punch & Judy in North Wales, Cheshire, Shropshire, Merseyside and Gt Manchester areas. On this site you will find all things concerning the Punch & Judy Show, together with a Directory of British Punch performers. Website builder Chris Somerville is also a working performer and as Mr Bimbamboozle he presents Punch & Judy mainly in Cheshire, Shropshire, The Wirral, Merseyside, Gt Manchester and North Wales areas.